In 1974 Frank Werner, originally from New York, retired to Moscow, Idaho after 20 years of service in the Marines. Since he had long acquired a taste for wild duck, and had had enough of plastic decoys, he decided to try his hand at making his own. Werner had taken several semesters of pattern making in high school and maintained an interest in woodworking. And while a Deputy Wildlife Protector for the Marines at Camp LeJeune, North Carolina he had used wooden decoys, so he knew how they should look on the water. 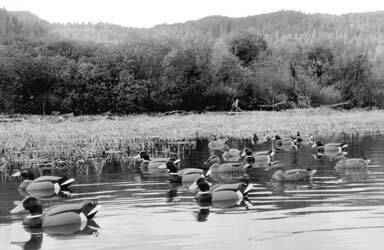 Armed with "Duck Decoys" by Eugene Connett, which he considers the best of the early books for decoy makers, he made a dozen divers, just the first of many gunning rigs that he has since produced. Werner has now carved somewhere between 600 and 800 birds, a few being decoratives, although he has never maintained records of his carvings. He enjoys all aspects of constructing a decoy, from the original design to the actual carving and painting. But his biggest thrill is seeing his rig of birds on the water at the first light of day. Watching them work provides inspiration for future carvings. Werner uses Idaho white pine whenever available, generally having to cut his own trees to furnish the wood. The decoys are painted in oils and each has a keel for hunting. Often he varies the head position within his rig, sometimes including sleepers within the group. When hunting season is closed he’ll often spend 70 hours a week carving, and he generally employ some common-sense economics by carving a rig at a time. When asked how long it takes to complete a decoy, he says, "It’s like fishing, it takes as long as it takes ‘til you’re done." Furthermore, he often has up to four dozen in process at any given time. And he doesn’t really consider his birds "done" until he has used them for a few seasons. Until then, they’re considered works in progress. His favorite decoys are his rigs of coot. Werner has studied coot for years and finds that most of the time they appear clumsy, gawky, silly or surly, but at rare moments they are graceful, elegant, dignified and intelligent. He tries to portray an alert, curious but confident stool. Werner prefers to sell his decoys to hunters who will actually use them, but he’s found that the price of wood has escalated to the point that it’s nearly impossible to maintain a price affordable for gunning. So many have found a home on collectors’ shelves. When it comes to his carving peers, he reserves his judgement on their works. However when it comes to old decoys Werner clearly favors those made by Joe Lincoln and Elmer Crowell. After retiring from the Marines Werner enrolled in the University of Idaho, graduating in 1984. He now lives in St. Maries, Idaho and is married with three grown sons. He is a member of the Governor’s Migratory Waterfowl Art Committee and serves as a judge for the state’s Duck Stamp competition. If he had unlimited time and money Werner would like to travel with his gunning rig and hunt in all the famous waterfowling areas throughout the country. He would also like to visit some of the better decoy collections – both private and public – to afford himself the opportunity to study and softly absorb the essence of these national treasures. Clearly his wishes veer from the practical to the aesthetic, but to Frank Werner they aren’t diametrically opposed.